If found to be true, the tasering of a cat would be "an extremely disgusting and despicable act." Acting upon a tip from an unidentified inmate, the body of a dead cat was retrieved from an area between security fences along the outer perimeter of the eleven-acre facility on April 14th. Since the incident is alleged to have happened a fortnight earlier, prison officials are not even certain if the corpse belongs to the cat that was allegedly tasered. "This is not being taken lightly," John McDonald, a spokesman for the Orange County Sheriff's Department, told the Los Angeles Times on April 16th. 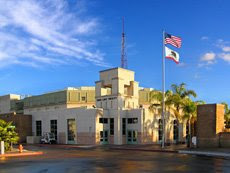 (See "Death of Cat at Orange County Jail Is Being Probed.") "This is a pretty serious matter." Although it is not known how many cats call the Theo Lacy Jail home or, more importantly, how they are otherwise treated, it appears that the tasering of the cat was a random act of violence committed by a rogue deputy. There certainly is not anything in press reports to suggest that this is standard departmental policy. Equally disturbing are reports in the Velvet Coffin that portray the facility, which houses more than three-thousand minimum and maximum security felons, as an out of control hellhole where deputies spend the bulk of their time on duty sleeping, watching the idiot box, reading newspapers, playing video games, and gassing on their mobile phones. This gross abdication of duty has in turn led to the creation of a class of so-called shot-callers within the inmate population who enforce their own distinctive brand of jailhouse justice. In particular, there is an ongoing grand jury investigation into the October 2006 stomping to death of inmate John Derek Chamberlain. Preliminary reports indicate that deputies stood idly by as shot-callers took turns beating, sodomizing, and urinating on him. Another investigation is underway into the April 1st tasering death of thirty-five-year-old Jason Jesus Gomez at the Intake Release Center in nearby Santa Ana. One more bit of telling evidence is the deputies' reported fondness for the television show Cops which has a nasty habit of glorifying the use of Tasers. In particular, deputy Jason Chapluk testified last August that his colleagues have a special affinity for an episode entitled "Tazed and Confused." Against such a backdrop it is not surprising that overzealous rogue deputies at the forty-eight-year-old facility would be tempted to try out their new toys on defenseless cats. More to the point, their behavior toward both cats and inmates is nothing short of criminal and county officials should take the bull by the horns and clean house from top to bottom. According to Amnesty International, around three-hundred individuals have died in the United States during the past six and one-half years after they were tasered by police officers. It is not known, however, how many cats, dogs, and other animals have been killed by these deadly devices. There is some anecdotal evidence to suggest, however, that both larger animals and people have a better chance of surviving being tasered than do their opposites. 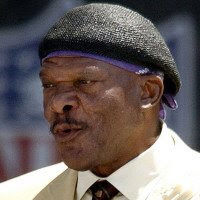 For instance, on April 9th former Minnesota Vikings' great Carl Eller not only survived being repeatedly tasered by police in Minneapolis, but he was not even fazed by the devices. (See photo on the right.) Although he is now sixty-six-years-old and was allegedly drunk at the time, his two-hundred-seventy pounds tacked on to a six-foot, eight-inch frame apparently made him impervious to the powerful electrical shocks administered by arresting officers. The number of pigs and other animals killed and injured during the developmental stage as well as by ongoing safety trials is another reason for outlawing these devices. Unfortunately, the horrific crimes of vivisectors are not taken seriously in America. For example, in addition to the millions of animals sacrificed each year in medical research, millions more are tortured, mutilated, and killed by drug companies, chemical manufacturers, and makers of consumer products, such as cosmetics, sunscreens, etc. Even more startling, the Interagency Coordinating Committee on the Validation of Alternative Methods (ICCVAM) has approved only four out of one-hundred-eighty-five alternative testing methods submitted to it since its creation by Congress ten years ago. By contrast, the European Center for the Evaluation of Alternative Methods (ECVAM) has approved thirty-four alternatives to animal testing since its inception in 1991 and has an additional one-hundred-seventy under consideration. "We were thrilled when the legislation was passed, "Sara Amundson, formerly of the Doris Day Animal League, told the Washington Post on April 12th. (See "Federal Panel Fails to Prevent Vicious Testing on Animals.") "It's shocking to look back and see how little we have accomplished." The same rationale applies in spades to the nascent campaign to get Tasers out of the hands of both cops and private citizens. Only an across-the-board ban will put an end to these totally illegal and barbaric street corner electrocutions of humans, cats, and dogs as well as the senseless maiming and killing of thousands of barnyard and laboratory animals. Even the Chinese, long excoriated for their merciless abuse and exploitation of the animals, are moving ahead with plans to reduce the number of laboratory animals that they sacrifice each year. In particular, researchers in Taipei are busy putting the final touches on an innovative computerized program that uses colored algorithms in order to digitally reconstruct guinea pigs. Photos: Orange County Sheriff's Department (Theo Lacy Jail), Lorain County (Blair), and Getty Images (Eller). "She at least knew kindness, comfort, and love before she died." Following her rescue on March 7th by employees of Samsel Supply, she spent the following two weeks in quarantine at the Cleveland Animal Protective League (CAPL) where she was nursed back to health. She progressed so rapidly that she was then transferred to the organization's foster care program. 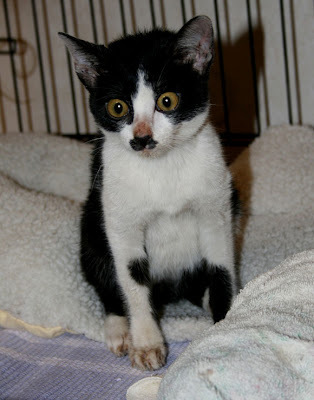 That is when something went terribly wrong because the energetic and loving kitten died within a day or two. 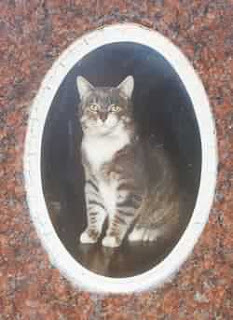 Her corpse has since been removed to the veterinary hospital at Ohio State University for a necropsy. Although the results of the necropsy have not been disclosed, preliminary indications are that her death was not caused by either rabies, panleukopenia, or any exotic disease that she might have brought with her from the Orient. Besides, she was put through a complete battery of tests while in quarantine. According to the CAPL's web site, forensic pathologists suspect that she may have died from either some congenital defect or that her immune system was somehow compromised during her long voyage and thus unable to function properly once she was removed from quarantine. It also is conceivable that she could have ingested poison or met with some sort of accident. Foul play cannot be totally ruled out either. "All things were possible with cats because some people seem to regard them as fair game for any cruelty," noted veterinarian and author James Herriot observed in his book, Cat Stories. Although the CAPL is certainly justified in ordering a necropsy, it alone will not address all the outstanding issues. For instance, why was Malli rushed out of quarantine and into foster care? Secondly, why was she placed in foster care rather than in a permanent home when dozens of individuals had expressed a desire to adopt her? In fact, Harvey earlier told the press that the cat was going to be adopted by one of her rescuers, presumably an employee of Samsel. Thirdly, why did The Plain Dealer wait almost four weeks before announcing that Malli had died? Since articles appearing on the its web site are undated, it is impossible to determine when the CAPL broke the sad news to the public. Both the CAPL and The Plain Dealer owe the public a full and complete accounting of the cause and circumstances surrounding Malli's death. The details of her early existence are sketchy but apparently Malli, her mother, and an unspecified number of siblings became trapped in the shipping crate in the Malaysian port city of Johor Bahru sometime between the first and fourth of February. Since Malli is estimated to have been no more than five or six weeks old at that time, it is possible that she and her siblings were born in the crate. The crate was then sealed and loaded aboard a ship which sailed from Johor Bahru on February 7th. It docked in Los Angeles on February 25th at which time the crate was loaded aboard a truck and sent overland to Cleveland. Rather than provoking an outpouring of sadness and grief, Malli's death has instead provided a convenient outlet for every cat-hater and his brother to vent his spleen. A visit to The Plain Dealer's web site reveals just how deep both ailurophobia and moral depravity run in the heartland of America. The taboo against speaking ill of the dead obviously has gone the way of the nickel cigar. Cat-lovers must nonetheless persevere and let illegitimis nil carborundum be their guiding principle. As for Malli, she was a genuine hero who will be sorely missed. Born around Christmastime, she barely lived long enough to see even the arrival of spring. 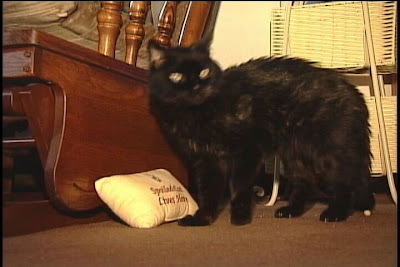 Nonetheless, her struggle to survive in the face of gargantuan odds was an inspiration to cat-lovers all over the world. Sadly, she will never know adulthood or have kittens of her own. (Most likely she already had been sterilized by CAPL anyway.) She will never frolic in the green grass, nap in the warm summer sun, or experience any of the other thousands of joies de vivre. She will not have died in vain, however, if the CAPL could be persuaded to keep her memory alive and Samsel would make it a matter of company policy to insist that its suppliers double-check their consignments for stowaways before sealing them. "We are absolutely disgusted and appalled that a council could resolve to commit such an atrocity on defenseless little cats." 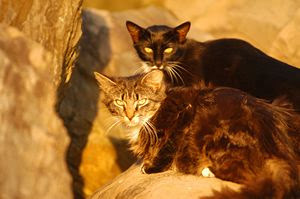 For the past twenty years, hundreds of cats have roamed the rocky beach west of Adelaide. Currently there are believed to be about thirty of them remaining, which is already a significant reduction from the fifty-five or so reported at the end of 2007. Presumably, prior eradication efforts account for the discrepancy in numbers. Although this dispute has been simmering on the back burner for a number of years, the council apparently was goaded into taking action by three loudmouthed cat-haters who complained that the cats have been scratching at their doors and relieving themselves on their precious jalopies. Blowhard media personality Bruce Abernathy was unable to contain his glee at the council's death sentence. "They're feral animals; it is as simple as that," he told Messenger Community News on April 16th. (See "Rock Cat Cull.") "In winter, we have fifty-five cats trying to find shelter in our garages, coming into our backyards...urinating on our cars and in our gardens." Just because he talks like a complete moron, does not mean that Abernathy is unaware that birds, mice, squirrels, raccoons, and countless other animals, especially beasts like himself that strut around on two legs, make far bigger nuisances of themselves than do cats. Nonetheless, absolutely no one goes into histrionics about their behavior; it is only cats that provoke such outpourings of antipathy and malice aforethought. Jim Douglas of the Western Adelaide Coastal Residents Association echoed Abernathy's blatant ailurophobia by declaring that his group was "totally and absolutely supportive of the council's decision." To top it all off, the phony-baloney RSPCA has agreed to act as hit man for Charles Sturt. In fact, the organization is quoted in a council report as advising that the most "consistent and reliable means of humanely killing an animal by shooting is by firing a bullet into the brain." With friends like the RSPCA, cats and other animals in Australia certainly do not have any need for enemies. Besides, if it had a scintilla of honesty in its wicked old bones the organization would change its name to the Royal Society for the Promotion of Cruelty to Animals. Mayor Harold Anderson, however, remains equivocal as to the exact method of execution. "Euthanasia by firearm will only be considered where all other options fail and it is deemed to be the humane and appropriate course of action as advised by the RSPCA," he told Messenger Community News in the article cited supra. Despite that concession, Anderson has branded desexing and rehoming efforts undertaken by Cats Assistance To Sterilize (CATS) as a failure. It is therefore highly unlikely that the cats will be allowed to remain under any circumstances. Knowing that its action would enrage the cats' protectors, the city council chose to arrive at its draconian decision in secret and to announce it without public debate. This cowardly act, quite expectedly, has drawn the ire of CATS' Christine Pierson. "We are absolutely disgusted and appalled that a council could resolve to commit such an atrocity on defenseless little cats," she told the Messenger. West Beach resident Dennis Wignall complained to the Messenger's web site that the council had "caved in to several noisy residents and a local celebrity to kill the cats." Sendy Radecki, another West Beach resident, not only concurred with Wignall's assessment of the council's motivation but also scoffed at the idea that eradicating the cats would prevent further dumping of unwanted animals. "Do you seriously think by killing these innocent cats that the problem will go away?" she asked incredulously. "It won't stop people using the site as a dumping ground." Half a world away, the editor of Moggies was equally outraged. "How sick of a so-called humane country to allow the RSPCA of Australia to kill (murder) cats. This is what you get from a backward country, not a democratic one," she wrote. "Humans do far more damage than any group of cats. To think otherwise is selfish and pathetic. As for the so-called residents, how much damage to the environment have they caused? Do we shoot them in the head as well?" The ABC's story is poorly written and contradictory and therefore cannot be taken as gospel. Even more telling is the petit fait that all other media outlets, including most notably the Messenger Community News, are silent on the RSPCA's reported change of heart. Australia's English colonizers have seldom shown any compassion toward either the continent's indigenous animals or the ones that they imported to help them conquer the forbidding landscape. Their policy always has been to extirpate any animal that either stood in the way of their financial interests or that they took a particular dislike to for whatever reason. Their current elimination campaigns directed against cats and other imported species is part and parcel of the same policy. Au fond, it amounts to nothing less than greedy capitalism dressed up in the trappings of conservation and ecotourism. 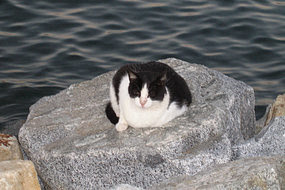 Photo: Messenger Community News (cats on rocky ledge) and ABC (cat near the shore). "Room 8 was a good cat. I liked him very much. He was the greatest cat in the whole world." It all began mundanely enough one day way back in 1952 when he scampered through an open window. From that inopportune beginning, he went on to spend the remaining sixteen years of his life roaming the hallways, visiting classrooms unannounced, sleeping on desktops, sharing students' lunches, and occasionally even inadvertently erasing a blackboard or two as he pussyfooted through chalk trays. It therefore was only natural that he was always the piece de resistance in every class photograph taken during that halcyon period. The venue was Elysian Heights Elementary School in the Echo Park section of Los Angeles and the gatecrasher was an unflappable gray and white cat known simply as Room 8. Although he crossed the Rainbow Bridge on August 13, 1968, he remains very much still alive today in the memories of the students, teachers, and administrators who were privileged to have known him during his all-too-short sojourn upon this earth. Former student Angie Medrano Nicolai first made Room 8's acquaintance when school principal, Beverly Mason, introduced him to her sixth grade class. "I remember thinking that he was a big cat in her arms," she recalled for the Los Angeles Daily News on April 1st. (See "Tabby Adopted by School Became National Celebrity.") "She wanted us to know that he belonged to the school and that there may be times he would come into our classroom to visit." "She put him down," Nicolai continued, "and he he immediately jumped up on the desk next to the window to take a nap in the warm sun." "I was lucky to be one of the sixth graders who got to feed the cat in the teachers' room every day," Elysian Heights alumnus Julie O'Neal Hines recalled for the Daily News. "We weren't allowed to have pets in my home, so a quick cuddle of Room 8's fat furry body was always a welcome thing." Former kindergarten teacher Toshi Ito, whose son Lance presided over the infamous "Juice" Simpson double homicide trial, remembers Room 8 as a cat who loved flowers and liked to drink out of faucets. 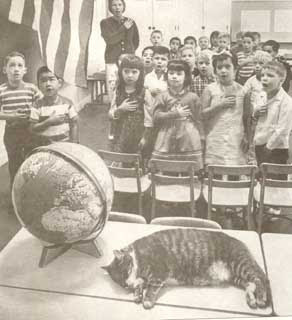 Vivian DeLeon, who was a third grader in 1968, perhaps said it best when she told the Daily News, "Room 8 was a good cat. I liked him very much. He was the greatest cat in the whole world." Not a great deal is known about Room 8's early years. He was born in 1947 but apparently ran away from home after having been abused by a boarder. 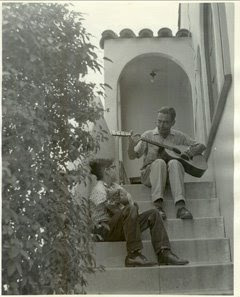 It is even more mysterious where he spent his nights, weekends, holidays, and summer vacations since he did not actually live at Elysian Heights but instead only visited when classes were in session. It is known, however, that he spent a considerable amount of his time with the Nakano family who lived near the school. As Room 8 grew older, school janitor Sam Ross would ferry him across the street to the Nakanos in order to prevent him from getting hit by a motorist. "He knew I'd see him safely across the street," Ross once fondly recalled. He also spent time at the residence of former student John Hernandez. "Room 8 stayed the entire summer with our family and our two cats. I believe it was 1962," he recalled for the Daily News in the companion piece cited supra. "Room 8 had, on various occasions, appeared at our backyard door looking for a meal which we obliged." Hernandez furthermore believes that there is a small chance that Room 8 may have impregnated his female cat and as a consequence some of his progeny may still be roaming the streets of Echo Park. Whether that is true or not it makes for pleasant speculation. Over the years Room 8 had two close shaves with the Grim Reaper. The first one came in 1963 when he was seriously injured in some sort of fracas and the next one was a year later when he contracted pneumonia. Luckily, he was able to secure medical treatment at Lockhart Animal Hospital in Hollywood and soon recovered. It is unclear, however, what he found so attractive about Elysian Heights in that cats generally prefer solitude to crowds. Likewise, it is not known if any of the teachers, administrators, and students ever attempted to give him a permanent home. Regardless of how he spent his time away from school, Room 8 always would show up as regular as clockwork each September for the opening day of the new school year. As word of his exploits spread, his reappearance was not only eagerly anticipated by students and teachers alike, but the local media as well. In November of 1962 he was featured in Look magazine and Weekly Reader published a story about him in 1967. He also appeared with Art Linkletter on the television show House Party and was featured in the 1968 television documentary, Big Cats, Little Cats. 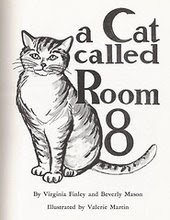 In 1966, Mason and teacher Virginia Finley published a biography about him entitled, A Cat Called Room 8. A handful of both new and used copies of the book, which was illustrated by Valerie Martin, are available on Amazon for between $97 and $125. During his lifetime, the cat received in excess of ten-thousand letters from fans in forty-seven states as well as from several foreign countries. Some of them even contained monetary donations for food. Fifth and sixth graders, who were given the task of responding to them, signed each one with a rubber-stamped replica of Room 8's paw print. Unlike so many spoiled celebrities, Room 8 never let his notoriety go his little head and remained the same self-effacing cat that he always had been right up until the time of his death at the age of twenty-one. He was then interred in Los Angeles Memorial Park in Calabasas where a three-foot-high granite tombstone featuring a memorial medallion adorns his grave. "The cat with the funny name is survived by pupils who have attended Elysian Heights (Elementary) School since 1953 (sic), the year he decided to make the school his home and the children his mascots," is how the Long Beach Press-Telegram eulogized him on August 14, 1968. The Valley News and Green Sheet, the forerunner of the Daily News, said succinctly, "There will be a familiar face missing from classroom eight at Elysian Heights Elementary School in September. The cat had become an international celebrity through the fifteen years of his schooling." Although Mason, Finley, Martin, Ross, and many of the students and teachers who knew Room 8 have, like him, passed away, the school to its credit has elected to keep his memory alive. Most notably, his paw prints were preserved in cement out front of the school on June 11, 1964. They are accompanied by a portrait drawn by Martin that bears the inscription: "Room 8. School Cat." "Everyone cheered! Television cameras rolled as he walked across the wet cement with his tail and head high," Mason and Finley related in their book. Los Angeles Times reporter Dial Torgerson remembered the momentous occasion somewhat differently, however. 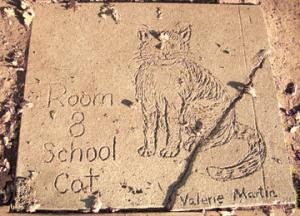 Room 8 "took fame with feline equanimity, posing casually for countless pictures, becoming ruffled only once, when asked to put his paw prints in concrete in front of the school. (He left so fast he provided a tail print, too)," he wrote upon the occasion of the cat's death. 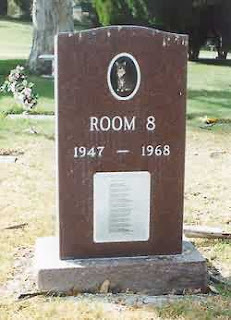 The memorial would later inspire guitarist Leo Kottke to compose an instrumental entitled Room 8 which he included on his 1971 album, Mudlark. Two paintings of Room 8, a bronze statue, and an enlarged version of his memorial medallion occupy a prominent place in a hallway. He also is the centerpiece of a triptych in the library and a fading image of him adorns the outside of one of the classrooms. A mural painted on the side of the auditorium by Yuriko Etue and entitled "Our State, Our Selves" shows him strolling through California history while inscribed in concrete at the corner of Baxter Street and Echo Park Avenue are twelve-inch letters which spell out "Elysian Heights School. 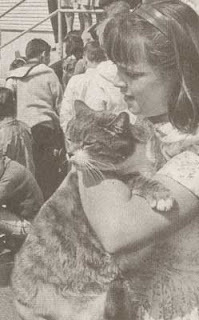 Home of Room 8, School Cat 1952-1968." Nearby, testimonials and images of the cat have been etched into the concrete by admiring students. One of them reads: "I love Room 8 because he sleeps on my desk." His image also can be found on calendars sold by the Echo Park Historical Society as well as on the walls of local restaurants. There is even Room 8 wearing apparel. Perhaps more significantly, teachers ensure that Room 8's memory will never die by reading Mason and Finley's biography to a new crop of students each year. "Room 8 taught us kindness to all beings and respect for life," current teacher Sheryl Gallo told the Daily News in the main article cited supra. All things considered, Room 8 did pretty well for himself even though, as far as it is known, he never earned a degree in spite of attending classes for sixteen years. Perhaps as August 13th approaches school officials will act to correct this gross oversight and award him one posthumously. Although two unidentified cats reportedly roamed the halls of Elysian Heights as late as the 1970s, it is highly unlikely that any felines would be tolerated today. The same goes for the horses, goats, sheep, and chickens that the school used to house in an outdoor enclosure. Every ailurophobe and his brother would go into histrionics about allergies, diseases, scratches, and security. Moreover, it would be exceedingly difficult for even the world's most intrepid feline to discover an open window through which to scamper in today's world of self-contained buildings. None of that in any way nullifies the numerous positives associated with cat ownership. In particular, studies have demonstrated not only that children exposed to domestic animals at an early age develop resistance to allergies, but also that cats help to reduce stress and to lower the blood pressure rates of those around them. More importantly, cats have a civilizing effect upon people in that they serve as a persistent reminder that there is more to life than strife, shekel accumulation, and mindless self-indulgence. With this realization also comes the deeper understanding that animals are far more benevolent and important to the continuation of life on this planet than man, despite all his pretensions, ever will be. Although officials at Elysian Heights have not announced how they intend to commemorate the fortieth anniversary of Room 8's passing, the fact that classes will not be in session on August 13th should not deter them from doing so. More to the point, if they could somehow muster the courage in order to buck the system they should seriously consider establishing a living memorial to Room 8 by adopting a successor. In time, this newcomer would sans doute inspire a new generation of both students and teachers. After all, there is a considerable amount to be learned from cats. Par exemple, just "staring at one will fertilize the mind," according to poet Christopher Smart. Down through the millenniums cats have lived, suffered, and died in anonymity with very few of their names, faces, and exploits having been recorded in either literature or history. Anyone who has ever shared his or her life with a member of the feline species knows only too well just what an egregious miscarriage of justice that has been. By keeping Room 8's memory alive officials at Elysian Heights have taken a giant step toward changing all of that. The process of enfranchising cats and other animals remains in its infancy but perhaps one day animal rights will assume their rightful place alongside human rights. After all, just because man has the capacity to exploit and kill animals at will does not make it morally defensible. Sixth century B.C. philosopher Pythagoras summed up the moral dilemma in a nutshell when he said: "As long as man continues to be the ruthless destroyer of lower beings, he will never know either health or peace. For as long as men massacre animals, they will kill each other. Indeed, he who sows the seeds of murder and pain cannot reap joy and love." As for Room 8, he remains an inspiration even to those who did not have the honor of knowing him but yet earnestly wish that they had made his acquaintance because he was indeed a very special cat. He also is a throwback to those simpler, gentler times when individuals were willing to make room in their schoolhouses, homes, and hearts for cats, dogs, horses, and other animals instead of treating them as nuisances or worse. Photos: Find a Grave (Room 8 sleeping and with schoolgirl), Echo Park Historical Society (Hernandez with Room 8 and Mason and Finley's tome), Roger Vargo of the Daily News (Valerie Martin's memorial to Room 8), and Scott Groll of Find a Grave (tombstone and memorial medallion). 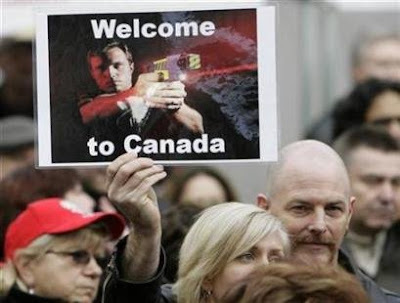 "We can taser them. Legally, although we don't have the authority to shoot them, you could taser them." Like cockroaches spilling out of an old urine-stained mattress, the cat-haters just keep on coming. It therefore is not the least bit surprising that as the antipathy that they harbor in their corroded breasts for the feline species continues to fester they are becoming increasingly desperate, violent and, above, mentally unhinged. "We can taser them," she crowed to The Chronicle-Telegram of Elyria on March 28th. (See "Commissioner: Once Stunned by Tasers, Felines Could Be Spayed, Neutered.") "Legally, although we don't have the authority to shoot them, you could taser them." That declaration leaves open the possibility that Blair would endorse shooting cats if she believed for one moment that she could get away with doing so. Although a professed cat owner herself, she quite obviously does not have any empathy for those felines who are less fortunately situated than her own companion. County dog warden Jack Szlempa was quick to agree with her as to the feasibility of tasering cats but drew the line at housing them at the dog pound. 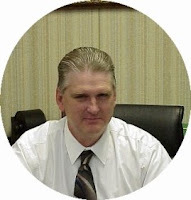 Since it is supported in part through revenues derived from the sale of dog licenses, he argued that it would be illegal to house cats at the facility. Reading between the lines, it seems safe to assume that Szlempa would be more than willing to accommodate Blair in her fiendish plot if it were not for the petit fait that he is far too lazy and cheap to care for any cats that might somehow miraculously survive being scorched with fifty-thousand volts of deadly electricity. Amherst resident John Lapinski, who ignited the controversy by complaining to the commissioners about cats, said that he was opposed to tasering them, not because it was inhumane, but rather because it would not work. "You get within eight to ten feet on them and they take off," he bellyached to The Chronicle-Telegram. He instead would like to see them licensed with the shekels generated from this scheme put toward trapping and killing all cats that roam. Regardless of whatever else can be said about this devout ailurophobe, detractors must grudgingly give him credit for having the chutzpah to suggest that devoted cat-lovers foot the bill for the execution of homeless cats. Blair's outrageous proposal received a tepid reception from her fellow commissioners. Ted Kalo, for instance, pleaded ignorance not only of cats and Tasers but the English language to boot. "I don't know what Commissioner Blair meant by the comment," he told The Chronicle-Telegram. The third member of the ruling triumvirate, Lori Kokoski, objected on the grounds that these horrible weapons should be reserved for use on dogs. "The only reason we use Tasers is to fend off an aggressive dog. It's not to catch a dog...," she said. Local animal rights groups also were quick to condemn this barbaric proposal. 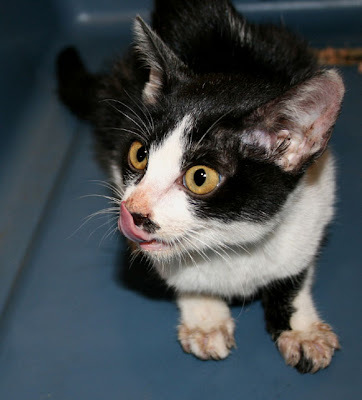 Denise Willis of the Friendship Protective League stated unequivocally that her organization neither owns nor has ever considered using such lethal weapons on cats. Instead, she quite sensibly recommends using humane traps baited with smelly fish. "It seems impractical as well as cruel," was the reaction from Peg Tucker of Community Action to Save Strays. "You would certainly traumatize them. If their adrenaline was up, they would have claws and teeth." On that last point she is most likely dead wrong. Since the inventor and manufacturer of these weapons, Taser International of Scottsdale, Arizona, recommends that they not be used on individuals weighing less than sixty pounds it is highly unlikely that any cat would be able to survive a blast from one of them. Since no individual or group should have the right to experiment on animals for any reason, the development of these weapons should never have been sanctioned in the first place. As noted primatologist Jane Goodall once astutely pointed out: "If anyone other than white-coated scientists treated monkeys, dogs, cats, rabbits, pigs, and so forth as they do behind the locked doors of the animal lab, he or she would be prosecuted for cruelty." Of special concern are non-native speakers and the deaf who are not in any position to comply with a police command to halt. Mobile phone users and those who are tuned in to loud music over headphones are vulnerable to surprise attacks as well. Tasers can also be deadly for individuals with chronic heart conditions as well as those with implanted pacemakers. The elderly and infirm, the very young, and pregnant women are considerably less able to withstand a jolt from these diabolical weapons than healthy adult men. As a result, dozens of product liability and wrongful death lawsuits have been filed against Taser International, including a few by police officers who were injured while learning how to operate the devices. Quite naturally, Taser vehemently insists that the weapons are safe. Despite the alarming number of fatalities caused by these allegedly nonlethal weapons, their usage is continuing to proliferate not only amongst the law enforcement community but with military personnel and private individuals as well. In fact, citizens in forty-three American states can legally own and use them. They also have emerged as the capitalists' weapon of choice in order to silence and subdue protesters. For example, they have been used for years in order to disrupt anti-globalism demonstrations at G-8 and other economic summits. Not about to be left out of the fun, campus police forces all across America now are armed with these deadly devices. In separate incidences, a student at UCLA was tasered by campus security inside Powell Library on November 14, 2006 while another pupil at the University of Florida in Gainesville got the same treatment during a speech by the Pickle Man on September 17, 2007. Like a knot on a log, the Democratic Party's 2004 standard bearer stood silently by and gawked as this gross violation of civil rights was committed. It does not take any genius to figure out that if these devices are lethal to both pigs and humans that the same would be true even more so for cats and dogs. Besides, it is virtually impossible to distinguish a homeless cat or a dog from a domesticated one. The crux of the problem with Tasers is that they allow police officers to carry out their duties the easy, albeit often lethal, way. For instance, instead of chasing down and subduing suspects they now instead can zap them with electricity. Consequently, numerous individuals are being denied their day in court because they are being unlawfully gunned down in the street by cops. The same will be true for cats and dogs if people like Blair are allowed to prevail. America is, or at least used to be, a nation of laws and as the result public officials must be held accountable for their actions. Cops, in particular, are paid to get their uniforms dirty and noses broken, not to dispense their own special brand of street corner justice. For those public officials and private individuals who simply cannot keep their hands off of homeless cats, the only halfway humane alternative is TNR. Likewise, just as there are humane traps for cats, police officers have an abundance of nonlethal methods (tear gas, pepper spray, lassos, etc) at their disposal in order to apprehend suspects. Should existing methods prove to be inadequate, there are numerous individuals scattered around the globe who certainly are creative enough to invent a nonlethal alternative to Tasers. Any such attempt no doubt would be met with stiff opposition from Taser International which annually rakes in around $50 million in revenues. Photos: Lorain County (Blair and Cordes), BBC (Taser graphic), and Yahoo News (Canadian protesters). Owner Al Palusky claims to have rescued him as a kitten way back in 1970 from a group of yobs that had cruelly trapped him in a trash can and were pelting him with firecrackers. Because he did not have any means of independently verifying Baby's age, the Guinness Book of World Records has never recognized Palusky's claim. Although there is considerable dispute as to which cat holds the longevity record, it has been firmly established that quite a few of them have lived into their thirties. More importantly, as advancements continue to be made in the fields of feline nutrition and veterinary care even Baby's record will be eclipsed sooner or later. Sadly, Palusky and his wife, Mary, now will have to find themselves a new heir. As for Baby, funeral arrangements have not been announced but hopefully he now will be able to requiescat in pace.